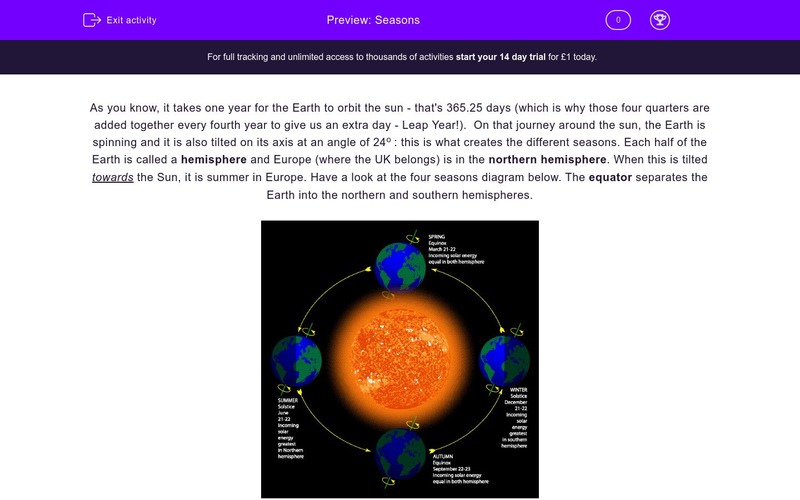 In this worksheet students will read an explanation of how the different seasons occur and will then answer questions on it. The Earth's axis is tilted and this creates the different seasons. Each half of the Earth is called a hemisphere and Europe (where the UK belongs) is in the northern hemisphere. When this is tilted towards the Sun, it is summer in Europe. Have a look at the four seasons diagram below. The equator separates the Earth into the northern and southern hemispheres. When the northern hemisphere is tilted away from the Sun, it is winter in Europe. The Sun is not very high in the sky at midday and days are much shorter than nights. The southern hemisphere is slightly closer to the Sun during its summer and that's why summers in the southern hemisphere are often hotter than ones in the northern hemisphere. Contrary to what most people believe, the northern hemisphere is further from the Sun during its summer. The Sun still feels hotter, though, because its rays are much more concentrated than they are in the winter, as the Sun is higher in the sky. This is what makes the difference. Summer days are longer, so the Sun has more time to warm the Earth. What do we call the northern half of the Earth? When the northern hemisphere is tilted away from the Sun, it is winter in Europe. Summers in the northern hemisphere are hotter than summers in the southern hemisphere. Why are summers in the southern hemisphere hotter than summers in the northern hemisphere? The Sun is higher in the sky during the summer. 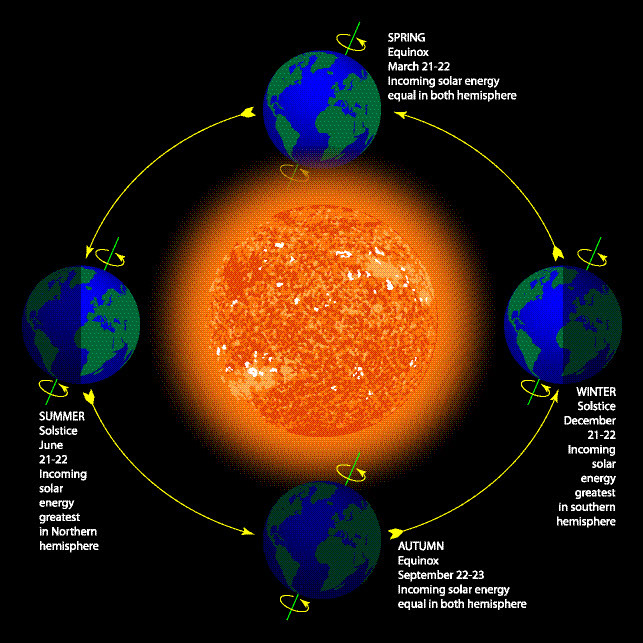 The northern hemisphere is further from the Sun during its summer than during its winter. Summer days are shorter than winter days. Why does the Sun feel hotter during the summer in the northern hemisphere? Tick two boxes. What do we call the 'line' that separates the Earth into the two hemispheres? The northern half of the Earth is called the northern hemisphere. Seasons exist because the Earth is tilted on its axis. When the northern hemisphere is tilted away from the Sun it is winter in Europe. This is true. Summers in the southern hemisphere are generally hotter than summers in the northern hemisphere because the southern hemisphere is closer to the sun during its summers. Summers in the southern hemisphere are hotter than summers in the northern hemisphere ,because the southern hemisphere is closer to the Sun during its summer. The Sun is higher in the sky during the summer. This is true. Contrary to what most people believe, the northern hemisphere is further from the Sun during its summer. The Sun still feels hotter, though, because its rays are much more concentrated than they are in the winter, as the Sun is higher in the sky. This is false. Summer days are longer than winter days. The Sun feels hotter during the summer than during the winter, because the Sun's rays are more concentrated and the Sun has more time to warm up the Earth as summer days are longer. The 'line' that separates the Earth into the two hemispheres is called the equator.